Join Dr Marina Nani and special guests on the brand new show to BYP TV- The Book Hour. 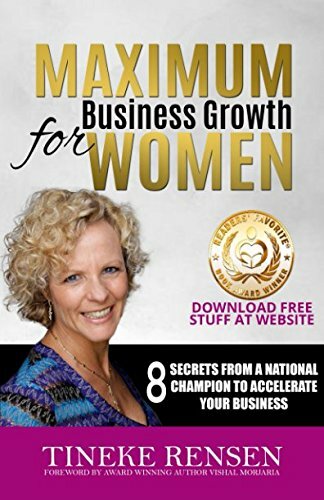 On this episode Dr Nani sits down with Tineke Rensen, a Dutch author, successful business woman and founder of Power Business Women's Network. Tineke Rensen celebrates her 28th anniversary as an entrepreneur in 2018. She started her first business when she was 25. It was in the era when there were no computers but typewriters, no cell phones but landlines and no e-mail but fax. She started her outdoor, kayaking and survival business, living outdoors in a caravan herself. She sold this successful international business in 2011 because she found no more growth. As well as in the business as in herself as the owner. Since then, she started to focus on business growth for women-owned businesses with up to 15 employees. She does this in her own unique way. Due to Tineke's extensive entrepreneurial experience, internationally with a team and her great knowledge of the new online economy, her customers get quick results. Tineke was elected the best female entrepreneur in the South of Holland. She was a member of two national sports teams, freestyle kayak, and freestyle skiing. She became Dutch champion and belonged to the European top. Tineke travels around the world to keep learning. This knowledge she shares during her inspiring and motivational lectures and events for entrepreneurs. She brands herself as THE MOST all-around business accelerator you can find. It took me a long time before I could commit to helping female entrepreneurs. To me, most of them came across as weak and looking for excuses to grow their business. Many people told me I should focus on just women but I felt resistance.Until my coach asked me the question: “Tineke, can it be possible that you are ignoring the feminine part inside of you?” He was right. We worked on this theme extensively. I started to see the beauty of femininity in business and the necessity of the feminine part of a business. If we need more women in politics and in the corporate world then why did we not need more and bigger female-owned businesses? And that became my passion. What is your solution for reinventing skills and Lifelong learning? It is one of my five core values, Personal Growth. Whenever I talk to people my mind is always scanning where I can be of value to this person. My desire is to help immediately during our conversation. I believe my desire for personal growth has its roots in my youth. I never felt good enough and was very insecure when I was a child and teenager. When I was 18, I had enough of this an I started hypnotherapy to become more confident. I did notice a change although I was not satisfied with the progress. So I tried many things after that. And every time I felt a little better. What made the biggest change to me was that I stopped criticizing myself. The biggest challenge I had to overcome was myself. I had to find out how good I am and own that totally. I had to get rid of the idea that women do not like to brag about themselves. If I didn’t position myself, then who would? The results and feedback from my clients showed me that I was right about myself. It was not easy going from selling the product I had with my former business to selling myself. I had to go through a huge transformation of self-awareness and gain again more self-confidence. Before I was always acting that I was self-confident, but starting to work with women, that was not possible anymore. Some of them saw that I was not congruent. What changes need to happen in your local community so women feel empowered and do things they want to do, by themselves? Most of the changes for women have to come from themselves. I am the living example of this. They need to stop being the victim, stop making excuses, stop playing small, and stop criticizing themselves. Men, naturally don’t do these things. Why would women do it then? Men feel no respect for this kind of behavior. Not even from their own wife. It is true that the language that is spoken in business and the behavior that is accepted is that of the men. But strong women can change this. And that is exactly why I work with this kind of women. When their businesses grow they will make more impact in the male-dominated world and they can start to create the change and understanding that women do business too but in a different way. What changes need to happen in our society so women feel empowered and able to do things they want to do, by themselves? Again, I believe women should make the change. By owning the strong parts of femininity, not the weak parts such as self-doubt, self-criticism, trying to prove themselves and so on. A Woman doesn't need to change to be successful, doesn't need to turn into a man with a dress. Subconsciously that is too odd to a man and it wears women out too. Men like to compete and if a woman adopts this kind of behavior men will start to compete with her. But if she plays the game of success and adopts other skills such as asking good questions, or show compassion even when it seems out of place, then men have no armor anymore. We try to beat them in their masculine way and that wears everybody out.